Edit item screen enables modifications of item fields such as quantity, units, price, aisle, discount, etc. To open this screen, tap on the right side of the row in current shopping list. Any change to item fields can be reverted by tapping Undo button which appears on top of the screen after any change is made, or from Menu > Undo. Item details can be changed with voice by tapping microphone button on top of the screen and then saying changes to be made, for instance “3 pounds” or “4 dollars 75 cents”. It is also possible to assign barcode by tapping Barcode button and scanning a product barcode. Please note that by default all changes to item fields are automatically propagated to items with the same name. Please see Linked and Isolated changes section below for more details. Tap on the right side of Qty/units area to choose measurement unit from configurable list. Or long-tap the same spot to enter any measurement unit as a plain text. Tap on the left side of Qty/units area to change item quantity. 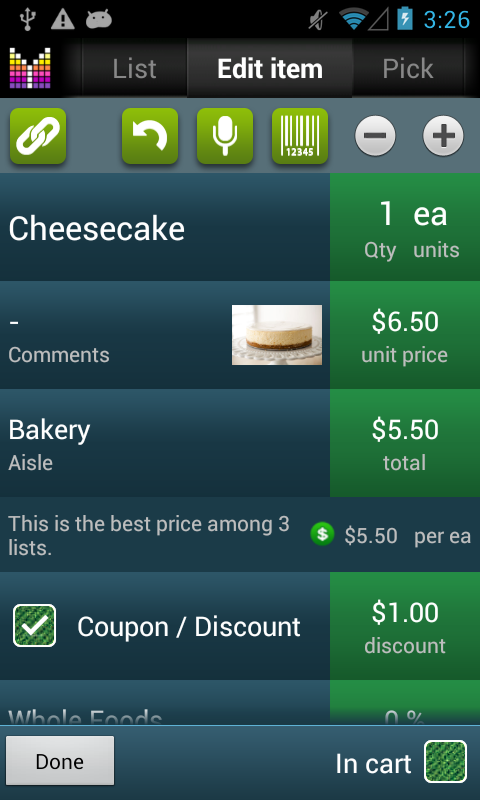 Tap increase/decrease buttons (above Qty/units area) to quickly adjust item quantity by configured increment. Long-tap increase or decrease button to set item-specific increment value. Tap unit price area to specify item price per unit. Total price will be calculated as Unit Price * Qty. Tap total price area to specify item total price. When you enter total price, unit price is calculated as Total price / Qty and then total price is re-evaluated to match Unit Price * Qty. ATM option allows entering price without decimal point. I.e. instead of typing “1.23” you could just type “123”. Note: Measurement Units can be configured in Units settings. Select shopping list you would like to move item to. Or you can select multiple destination lists for copy. The item is moved or copied to a selected shopping list(s). 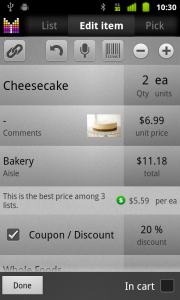 Coupon indicator feature enables two things. First, it is possible to specify discount value as either percent or fixed amount and get item’s total price adjusted by the discount. Second, in shopping list, item will have an icon indicating if it has a coupon. Tap Coupon / Discount field. Discount menu shows up. Enter discount value when prompted. Now your item has a discount associated with it. When you tap Coupon / Discount field again, you will be offered to Set expiry date or Remove coupon. If you’d like attach a photo to your item, just tap Photo button next to the comments field and choose Pick photo or Take photo. Pick photo allows you to select a photo from your photo gallery or from your SD Card. Take photo uses your handset’s camera to take a photo and then attach the photo to the item. When a photo is attached to an item, tap the photo and you can View photo or do some changes. Pick photo or Take photo will replace existing photo with a new one. Clear photo removes the photo from the item. NOTE: This is a Premium feature and it requires Mighty Grocery to be logged in to an account. To see the history of item purchases, tap the Link button in the upper-left corner of the Edit Item Details screen and choose Price History. If you want to indicate that item is taxable, tap on tax field to show Tax value menu. Tax rate values are specified in Menu > Settings > Options > Regional settings > Tax rates. Total price of an item is updated to reflect selected tax rate. You can also long-tap tax field to enter any specific tax value for this item or choose Edit option from the Tax value menu. Choose Set as default to assign current tax value as default to all new items. By default, all items with the same name are linked and any changes in shopping list will propagate to Favorites and Pick list, also any changes in Favorites will propagate to Pick list. This means that any change to name, quantity, price, aisle are propagated to all items with the same name following this route: Shopping lists –> Favorites –> Pick list. Changes in Pick list won’t propagate to Favorites or Shopping lists. In case you would like to unlink items to provide isolated changes, tap the Link button in the upper-left corner of Edit Item tab and choose Unlink. Help: I added a new item and it defaults to isle “Other “. When I edit item and go to select a different isle…Dairy is not an option and many others are not listed that are listed in the settings tab. Hi Carl, thank you for your question. Most likely, your shopping list has customized aisles, but aisles such as Dairy were not added to that customization. I’d recommend resetting aisle configuration for your shopping list so that all default aisles would be available. Please see Manage aisles User’s Guide for more details. I love this app! Just have a question on how I could input a discount AND a coupon on a piticular item? For an example, an item is on sale buy one get one free and also I have a coupon for each item. Also, I would like to see a place for a discount off a total order (ex: $3 off $30 coupon). Thanks! Hi Chelse, thank you so much for your feedback and your question. Unfortunately, it is only possible to apply one coupon or discount at the moment. 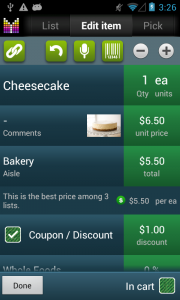 Multiple coupons/discount will be considered as part of future improvements to Coupons feature. As for adding discount off the total price, the only option at the moment is adding item with negative price to your shopping list. Hi there. Is there a way to sort and compare prices by brand and store. For example I edit milk and I can then tick a sub category ( manufacturer – brand) eg brookside, clover dairies. Then could it also be possible to compare prices by store with sub brands. Sorry if it sounds complicated. I hope you get my meaning. Hi Derrick, thank you for your question. Yes, the Compare store prices feature is one of the top-priority planned features. Unfortunately, no specific dates yet. I just upgraded to Pro. The one feature I need is additional taxes (in addition to sales tax) on individual items. Recycling fees and deposits on bottles or containers are really difficult to figure out. But- they’re something this program could save. It’s similar to coupons but these fees add to the price of the item. A 2l bottle of soda has 26¢ per bottle in British Columbia. Hi Joanna, thanks so much for your feedback and your suggestion. We are considering adding additional taxes in the future. In the meantime you may want to try using coupon field for tracking bottle price. If coupon value is negative it will add on top of the item price. Hello, I am new to this app and just upgraded to the full version. 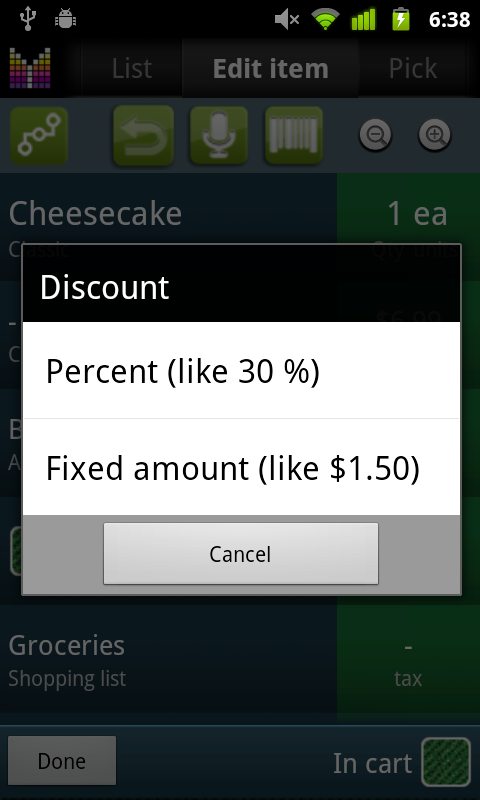 So far I love the app but just wondering if I can add two discounts to one item? Like if I have a coupon and I have 15% off for military discount. Is it possible to add both? Or just keep taking the coupon off the total like I have been? Hi Brandy, thanks for your question. Unfortunately, there is no way to add multiple discounts to an item. We consider adding this feature in the future. I installed the Lite version and after one shopping trip upgraded to the full. I have a bit of trouble at times with the bar code reader but feel it is not the fault of the program. What happens is a shiny label will reflect the lights making it difficult for the camera to get a good image. Non-shiny labels do not have this problem. I like the fact that when I scan a code and someone else has published it, the information will appear on my screen. Any I find not in I will publish to do my part. I would like to see an option in the discount/coupon that will allow me to enter the ‘sale’ price. Now I need to back out and bring up my calculator to subtract the regular and sale price to get the amount to enter into the discount field. Can you specify different aisles by store? One store will have certain products on aisle 1 from another store. Or say in a hardware store you will not have a Dairy aisle but a Plumbing aisle instead. Hi Mike, thank you for you feedback and your comments. Ability to enter sale price sounds interesting, though why don’t you put that price in the Price field without discount? Just need to understand why this is inconvenient for you. As for configuring aisles, yes, it is possible to do using Manage Aisles feature. Hi Jensine, thank you for your question. To add items that are 2/$5 I guess you just need to set Qty to 2 and Price to $5 in Edit item details screen. As for adding coupons, it is possible to add $.40 off using Coupons feature but unfortunately you will need to track quantity manually. Bingo! That did it. Now I see the pick list. Thanks for your help. 1. A pick list was what I was expecting to see. But what I do see is a blue box labeled “Units”, a field containing the default unit (which I can then change by typing over it), and two buttons beneath the field labeled “Save” and “Cancel.”. But no pick list. 2. OK, I thought it was pilot error somehow on my part. (I’m new to Android, having just left webOS.) I can live with it. Brian, it seems like app responds as it would get a long-tap. Try making a shorter tap on Units section. 1. I can’t seem to figure out how to edit the units for an item. The app defaults to “ea” but for example, I want to change milk’s units to gallons. How do I do this? 2. In portrait mode, when editing an item’s price or other specifics, the virtual keyboard pops up, but then doesn’t go away when I’m finished. This obscures my view of the other menu options. Hitting back clears it but why doesn’t it go away automatically when I’m finished with my input? Hi Brian, thank you for your question. 1. 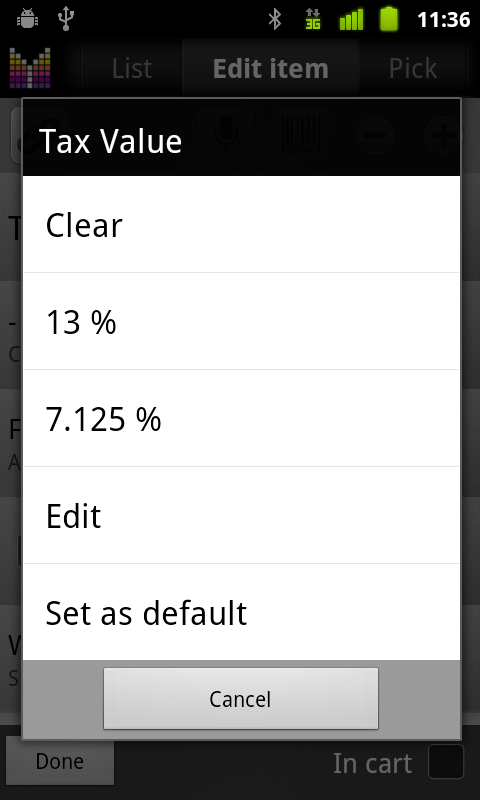 To change units for an item just tap the units section on the Edit Item Details screen (on the right of Qty section). You will be presented to choose from a set of units configurable through Menu –> Settings –> Units. Long-tap will allow typing any units name you want. 2. Unfortunately, we could not overcome the glitch of onscreen keyboard for several phone models. Clicking Back is the only solution for now. Sorry for inconvenience.